View More In Planning Boards. Mastervision - White Plastic Set Of Letters Numbers & Symbols Uppercase 1" Dia. 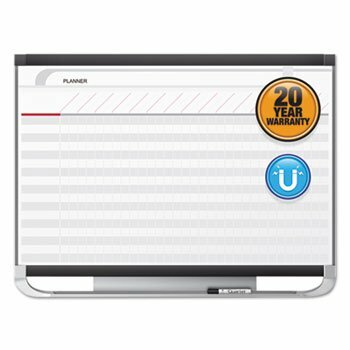 "Product Category: Presentation/Display & Scheduling Boards/Board Accessories"
Mastervision - Grid Planning Board W/ Accessories 1X2" Grid 48X36 White/Silver "Product Category: Presentation/Display & Scheduling Boards/Planning Boards/Schedulers"
Mastervision - Grid Planning Board W/ Accessories 1X2" Grid 36X24 White/Silver "Product Category: Presentation/Display & Scheduling Boards/Planning Boards/Schedulers"
Quartet - Prestige 2 Total Erase Four-Month Calendar 36 X 24 Graphite Color Frame "Product Category: Presentation/Display & Scheduling Boards/Planning Boards/Schedulers"
Mastervision - All-Purpose Planner W/ Accessories 1X2 Grid 36X24 Aluminum Frame "Product Category: Presentation/Display & Scheduling Boards/Planning Boards/Schedulers"